Nottingham Forest handed Arsene Wenger’s men their second defeat in 24 FA Cup games. For the first time in the Arsene Wenger era, Arsenal have been knocked out of the FA Cup at the third round. The FA Cup holders were unceremoniously sent home by a team sitting 14th in the Championship. Nottingham Forest handed Arsene Wenger’s men only their second defeat in 24 FA Cup games, as they’ve won the tournament in three out of the past four seasons. Two career-defining goals from Eric Lichaj, a Ben Brereton penalty and a second penalty scored by Kieran Dowell gave Nottingham Forest a famous win at the City Ground. The Reds are now the first lower division side to score 4+ goals against Arsenal in the FA Cup since Hull City in 1908, this just exemplifies the enormity of the result. Here are the main talking points from the game at the City Ground. Per Mertesacker was run ragged and looked way out his depth. The world cup winner may be retiring at the end of the season, but for most Arsenal fans, that may be too far away. Against a poor Championship side, Per Mertesacker was run ragged and looked way out his depth. It was a sad sight to watch, but a once competent defender was made to look inadequate at the City Ground. The German has played 220 games for the Gunners but if this was his last, no Arsenal fan would shed a tear. Every time a ball was lofted over the top, the 33-year-old looked like a dear in the headlights, frantically stretching his long legs in the hope he could catch Ben Brereton. 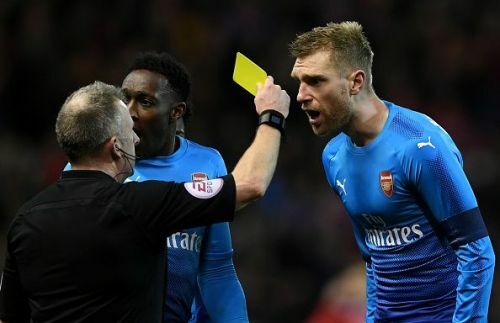 Against a team that’s scored 0 goals in their last 3 games, a defence led by Per Mertesacker conceded 4 goals while the German himself was dribbled past twice.